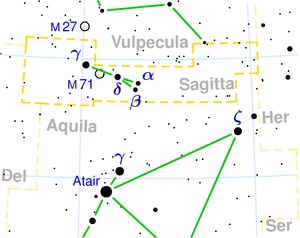 Sagitta ( Latin: arrow) is the third-smallest of all constellations (only Equuleus and Crux are smaller). Ptolemy included it in his list of 48 constellations. At that time, however, it was even smaller, spanning only about 4 sq. deg. It is also on the list of 88 constellations now acknowledged by the IAU. Located not very far to the north of the equator, this constellation can be seen from everywhere on Earth except for within the Antarctic circle. Sagitta is surrounded by the following constellations (beginning at the north and then continuing clockwise): the little fox Vulpecula, the mythological hero Hercules, the Eagle Aquila and the Dolphin Delphinus. It lies in the Milky Way, pointing eastward and shows clearly the shape of an arrow flying towards the Swan, Cygnus. Although ancient, is insignificant, for it has no star larger than the 4th magnitude. The Five Stars are its most noticeable feature. Sagitta was its common title with all the Romans who mentioned its stars. [SLM p.349]. It has been regarded as the traditional weapon which Hercules used to kill the eagle (Aquila) of Jove that perpetually gnawed Prometheus' liver. The Arrow is located slightly above the Eagle. Some see the Arrow pointing to the east, others to the west. In conjunction with the story of Aquila it should be seen pointing to the west, aimed at the Eagle. Others believe the arrow to be the one shot by Hercules towards the adjacent Stymphalian birds (6th labor) who had claws, beaks and wings of iron, and who lived on human flesh in the marshes of Arcadia - Aquila the Eagle and Cygnus the Swan, and Lyra the Vulture - and still lying between them, whence the title Herculea. Eratosthenes claimed it as the arrow with which Apollo exterminated the Cyclopes. It sometimes was the Arrow of Cupid's bow. * α Sge: also known as Sham, this yellow bright giant star of spectral class G1 II (with 4.37m) lies at a distance of 610 light-years and together with β Sge (also 4.37m) forms either the feathers of the shaft or the two-pointed arrow once used in the Roman army. * γ Sge: this cool giant (M0 III, 3.47m) represents with the stars δ Sge and ε Sge the shaft. It lies at a distance of merely 170 light-years. * η Sge: this star of spectral class K2 III with 5.1m belongs to the Hyades moving group. * M71: this object is a very loose globular cluster mistaken for quite some time for a dense open cluster. It lies at a distance of about 13,000 light-years from Earth and was first discovered by the French astronomer Philippe Loys de Chéseaux in the year 1745 or 1746. In the past Sham designated the whole constellation instead of only α Sge. This constellation is one of those cases where Johann Bayer failed to name the stars in the correct order, in this case even degrading the brightest star to mere γ-status. Another example for such misjudgement is the constellation Sagittarius. Although Sagitta doesn't contain any bright stars, many cultures have seen an arrow in it , among them the Persians, Hebrews, Greeks and Romans. So there are various stories trying to explain the meaning of Sagitta. 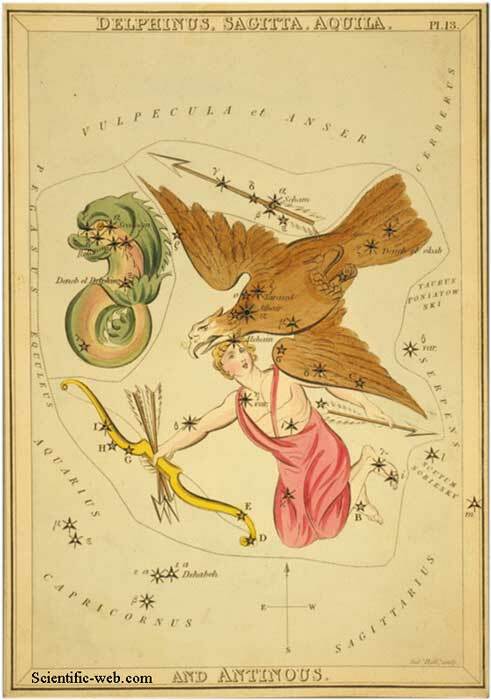 The two most important ones both take into account the neighbouring constellations Hercules, which had in earlier times been identified as a stag, (to the west) and Aquila (to the east). According to the first one the Titan Prometheus stole the fire from the Gods and brought it to the mortals, thereby irritating Zeus so much that he was chained to a rock where an eagle (represented by Aquila) ate his liver each day; as Prometheus was immortal his liver grew back each day, and the eagle would return and eat it again... Herakles (identical to the Roman Hercules) saved him from this never ending punishment during one of his Twelve Labours by killing the bird with an arrow shot and then setting him free. Another story relates how Herakles killed the Stymphalian Birds, that terrorized Arcadia, with a rattle. The Stymphalian Birds themselves were identified with the constellations Aquila, Cygnus and Lyra. Sagitta was further interpreted by some as Cupid's Arrow or as an arrow shot by Sagittarius at Scorpius. Other interpretations considered the arrow to have been shot by Centaurus at Aquila, since Centaurus faces the correct direction and is at an appropriate angle to the arrow, whereas Sagittarius is immediately below it facing in the opposing direction (i.e. towards Centaurus). As a result of the interpretations where Centaurus shot the arrow, may have come the myth in which Chiron (who was usually identified as Centaurus), having been painfully wounded by Herakles, gives up his immortality to rid himself of the pain, and takes the place of Prometheus, Herakles/Chiron then killing Aquila so that Chiron doesn't suffer as Prometheus did. As such, together with Lupus, this may have formed the basis of the tale of the Erymanthian Boar (which was one of Herakles' labours).